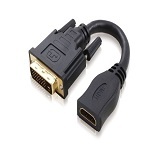 The 15cm DVI-D (M) to HDMI (F) Adapter Cable - Male to Female is used to convert a DVI signal to HDMI signal. The adapter is bi - directional and also works to convert a HDMI signal to a DVI signal. The unique cable design provides flexibility during installation as the connector can move freely in all directions and different angles.